So here is the front and right side of the box. 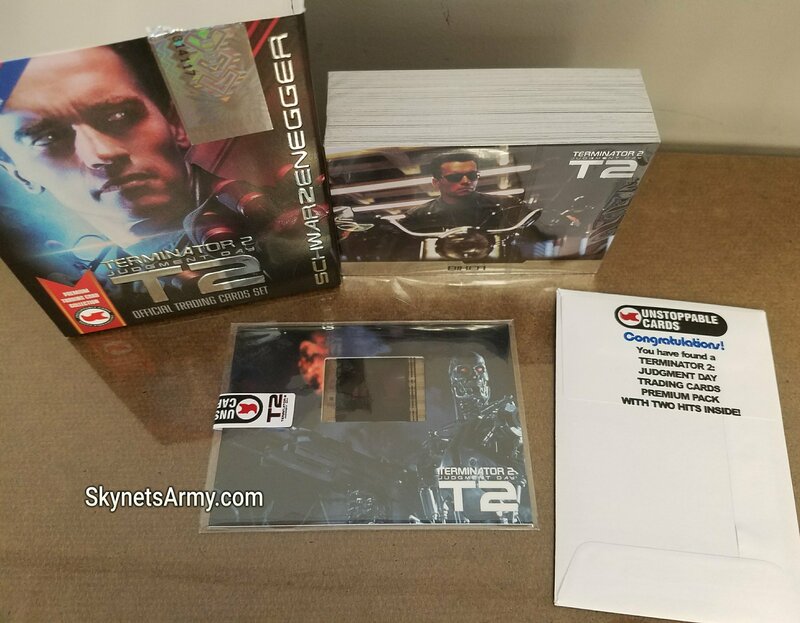 The reflective foil T2 logo and other lettering is very striking and definitely eye-catching! So are the sketch card images featured on the side. Let’s turn the box around. 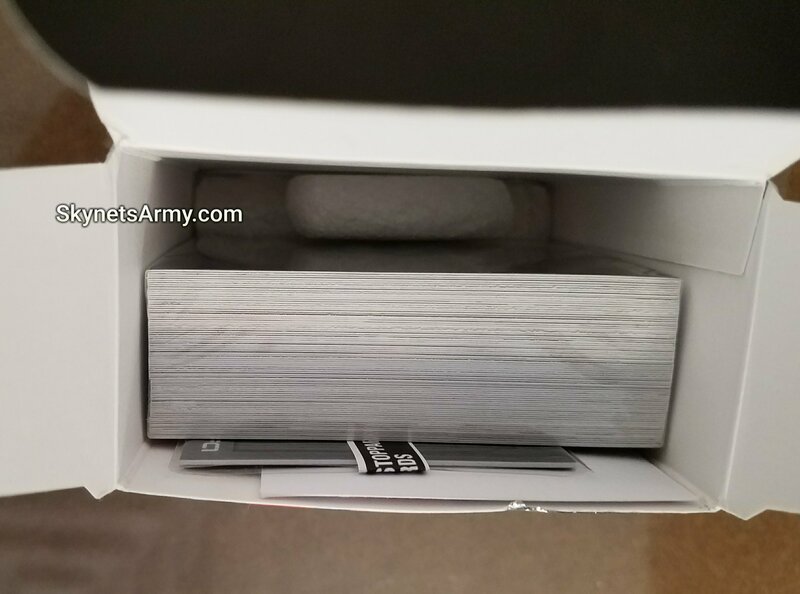 On the left side of the box we see some sample images of the cards inside, while the contents are detailed on the back. Now we will take a peek at the bottom of the box. 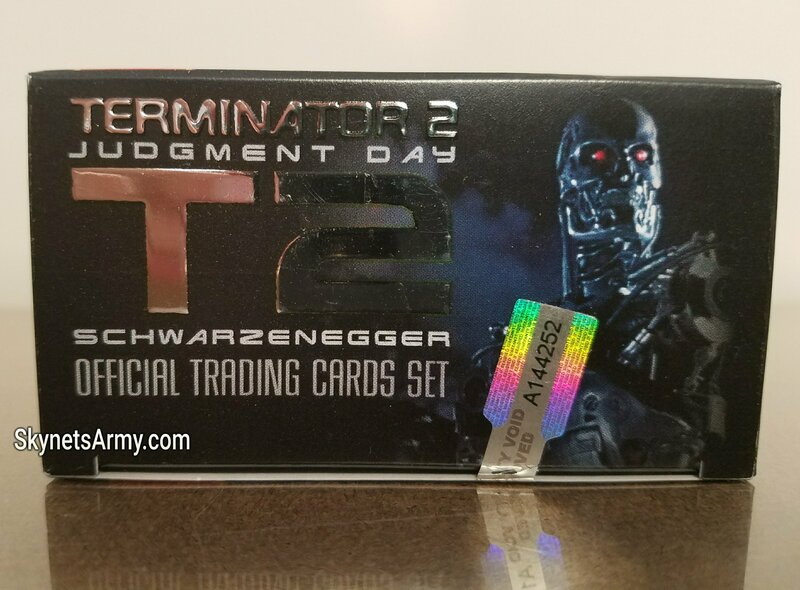 More reflective foil lettering and a great image of the T-800 Terminator! 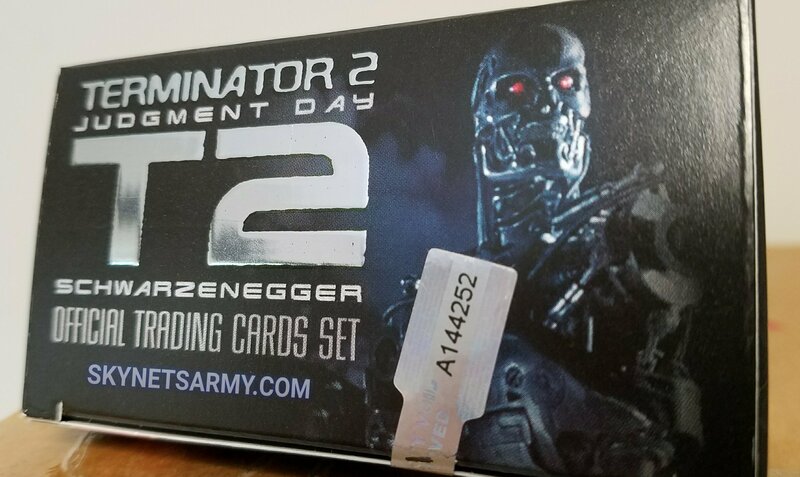 A nice touch is the T2 logos and all the foil lettering is embossed, as in they feel raised beyond the surface of the box. Now let’s check out those contents! 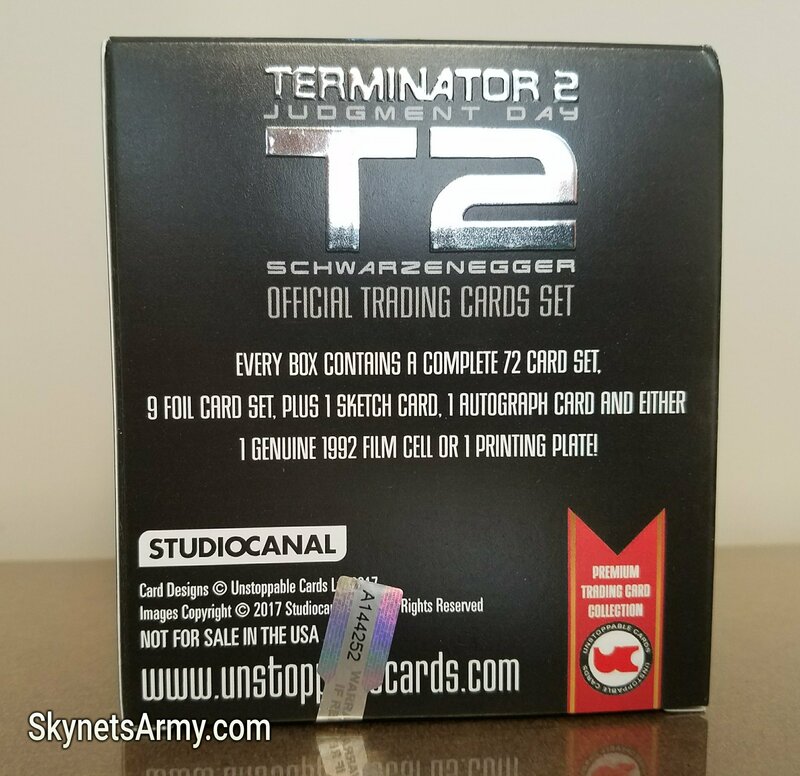 So inside we will find a complete 72 card set, plus a 9 card foil set, plus a sketch card, an autograph card (we hope we get Arnold Schwarzenegger’s autograph) and a genuine film cell or printing plate! Let’s open the top of the box! Ignoring the styrofoam, there are three items inside to remove. Time to pull them out! All three items are either wrapped in clear plastic or incased in a paper envelope. Let’s see what is inside the envelope first! Okay! While we didn’t receive a signature card of Arnold Schwarzenegger, we did receive an autograph of Mark Christopher Lawrence, otherwise known in T2 as the Burly Attendant! 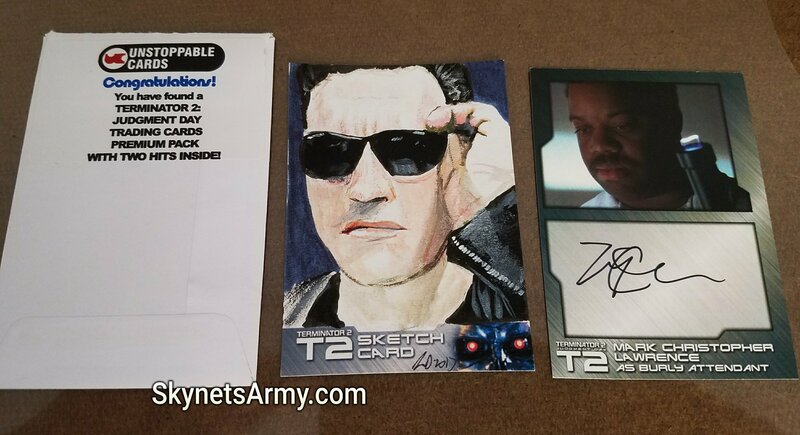 We also received an authentic sketch card of the T-800 Model 101. Let’s flip these cards over. 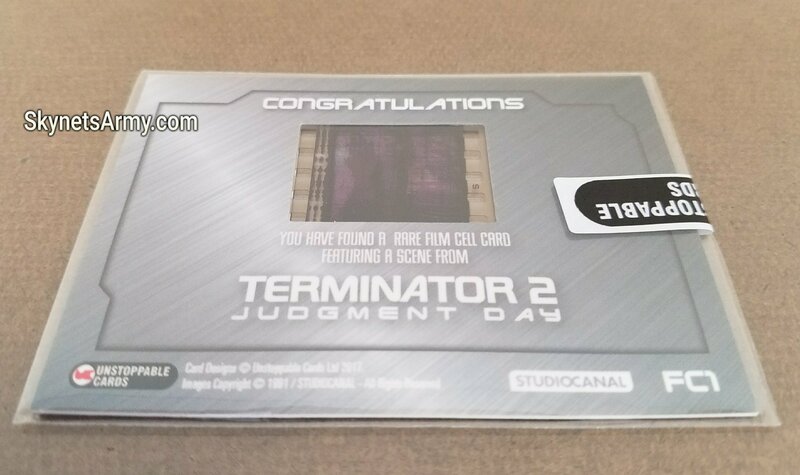 So here we received an authentic rare film cell card, featuring an actual film cell taken from a trailer reel for “Terminator 2: Judgment Day”! We need to hold this up to the light and take a better look at it! 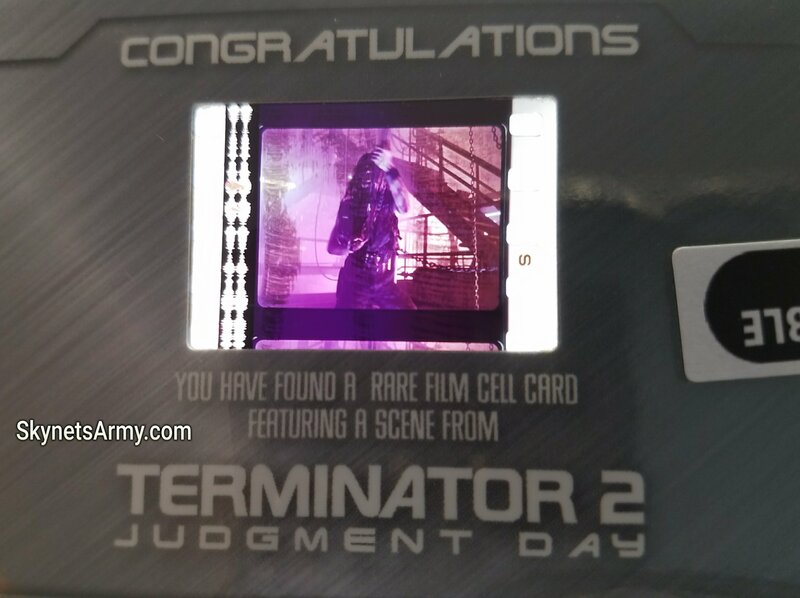 It appears our film cell is of Sarah Connor cocking her shotgun, as played by actress Linda Hamilton! That is definitely cool. Now it’s time to spread out all the cards! Wow! That’s a lot of cards! On the backs many of them feature puzzle images that form larger pictures if assembled correctly. And included among the cards, is a card checklist to help you keep track of what is in a complete set! Well that’s it Terminator fans! 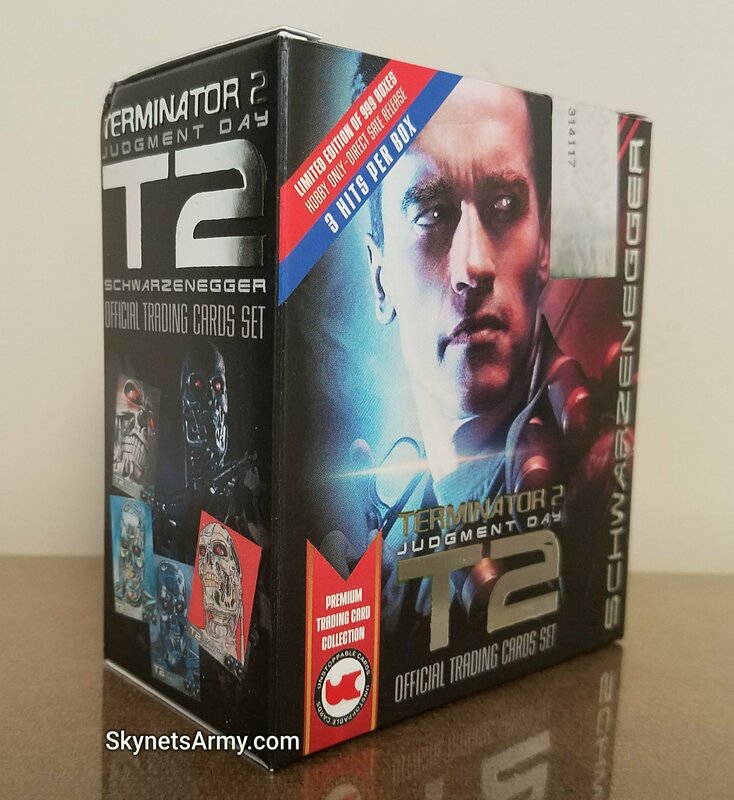 We hope you enjoyed this unboxing of Unstoppable Cards’ TERMINATOR 2 2017 Trading Cards Box! If you’re interested in getting your hands on one of these great box of cards, CLICK HERE. 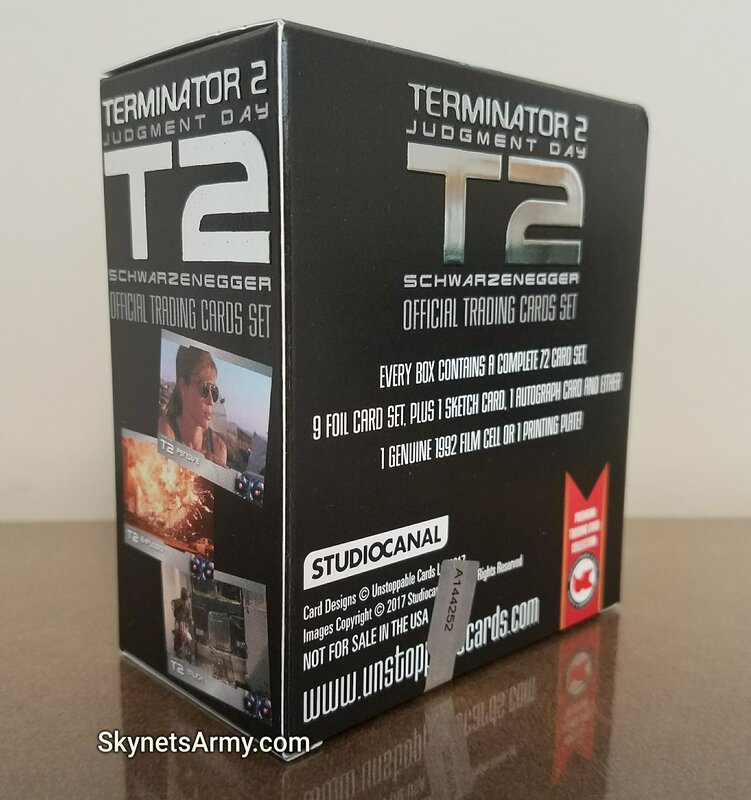 Previous PostSKYNET’S ARMY Special 25% OFF Pre-Order of the Pure Arts T-800 Art Mask!Next PostNEW PODCAST EPISODE: Fans say goodbye to “T2 3-D: Battle Across Time” and we talk T2029 the official T2 Board Game! I used to own a lot of cards! Shoeboxes full!